• If customers spend £100 or more in the fishing lodges on tackle and/or clothing they can take a free day boat *on the same day of the purchase*. • If customers spend £50 or more on tackle and/or clothing then they can take a day boat for half price *on the same day as the purchase*. Single man boat was £17 offer price £8.50 Boat for 2/3 anglers was £27 offer price £13.50. *offer excludes half day boats*. Rutland is buzzing! Both Browns and Rainbows are feeding heavily on the early buzzer hatches which are coming off in huge numbers, including large buzzers which are normally associated with the May/June period. All this has resulted in another great week on the reservoir with lots of fish caught. Season ticket holders Ron Oldroyd and Paul Wild had a very successful day afloat down the South Arm using buzzer tactics with 32 fish, many of which were overwintered. Bank anglers Mick Connor and John Lee came across overwintered fish off the Peninsula last Friday evening. Amongst the overwintered fish have been Rainbows up to 4-5lb and numbers of Browns in the 4-5lb region. One fine specimen was a Brown estimated at over 6lb returned by Mark Rose whilst he was fishing in the Sportfish Team Challenge Competition on Sunday. The weather was varied last week with cool northerly and easterly winds early in the week resulting in a significant number of fish moving off the dam in the late afternoon and evening. The brighter hot, cloudless conditions over the weekend made no difference to the fishing with great numbers of fish caught in the Anglers World Sportfish match (see Competition News). It’s good to welcome several newcomers to Rutland this season, with many catching their first ever Rutland trout. The Tuesday Night Boat League starts on 9 May. This popular event is open to everyone and it’s very straightforward to take part. Book in at the fishing lodge from 5pm onwards with boats going out at 6pm. Supper delivered by ‘Syd’s Fish and Chip Shop’ is available at an additional cost, with a free cold drink provided by Anglian Water after the weigh in. The league runs from 9 May through to the middle of August with a free midweek boat awarded to the angler with the biggest fish caught on the night each week. Each week the heaviest six bags earn points with a prize awarded at the end of the series. 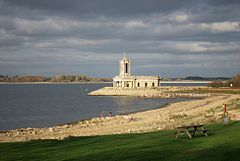 Rutland Water hosted a North of England heat of this popular international. There were some outstanding bags of fish and the match fished to a rod average of 11.6. 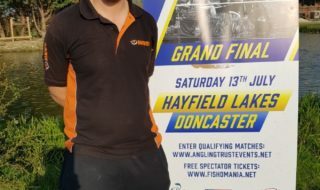 The top five teams have qualified to fish in the Northern Regional Final at Rutland on 10 July. Tom Finney, fishing for 7th placed Iain Barr Fly Fishing Team Costa B, took the best fish at 5lb 13oz and also the best bag weighing in at 35lb 12½oz. This match for teams of six anglers fished to a rod average of 15.06 with some terrific bags of fish. Best Rainbow 4lb 2½oz taken by Lindsay Simpson. Best Brown 5lb 13oz taken by Tom Finney. Best boat areas Middle area of North Arm, bottom of the South Arm, Normanton/Sykes Lane. Best bank areas Normanton, Sykes Lane, Yellowstone, Peninsula. Best methods Buzzers, floating line (bung), straight lining. Midweek boat winner John Eaton of Horncastle. Beginners courses 15,22 & 27 April; 7,13, 19 & 26 May and other dates throughout the season. The wonderful weather and superb fishing is still continuing at Grafham. The rod average is up from 7.4 to 9.3 this week, with an amazing total of 1,457 fish caught. This week we have seen the biggest Rainbow of the season so far with Yvonne Webb weighing in a fine specimen of 6lb 13oz caught at Savages. The best Brown of the week went to Mr D Lyall who took a lovely 5lb 11oz Brownie off the Harbour Arm. There are a number of notable catches this week. Congratulations to Steve Jones who landed 48 fish on Sunday 2nd April. Steve is having a superb season so far with consistently high numbers of fish being caught. Norman Rushton has also continued his great fishing with another bag over 20, recording 24 fish this time. Other mentions and congratulations go to Martin Brocklebank who had 20 (including 2 Brownies), D. Harwick, also 20 and finally to Chris Mully who had a superb day on the 7th catching 30 Rainbows and 8 Browns. The bank is still a challenge but fish are being caught, however boat anglers are still producing the highest numbers of fish caught. Brownies have been in season all this week and it is nice to see a few big ones coming out. Many have tried fishing the recently re-opened Savages and West Bank and a number have had good fortunes, especially at Savages. Boat angling is producing the best results at the moment with a number of anglers catching in excess of 20 fish. Anywhere along the north shore is proving profitable and it is worth moving up and down to find the fish. Savages is a good spot for catching over wintered fish. Martin Webster and Matt Harris fished there on Tuesday and caught many fish 4lb and up (on Buzzers). Although it may seem a little early in the season, Shrimp patterns are working well for catching overwintered fish. But floating lines, fished near static, with buzzers have still provided many fish this week. Anything black, black and green, or black and white patterns. Black and Red Buzzers, Blobs and intermediate lines (Di5 and Di7’s) fished with lures in the same areas are still producing fish. Other successful flies include cats whisker, humongous, damsels and boobies. Bank angling is still more of a challenge this week. The fish have moved from the shore to roughly 150 yards out. When the wind permits, the harbour arms and Marlow Stones are showing good results. Lures are fishing best from the bank particularly in white, white and green, black and black and green colouring with fish following right up to the draw so keep those sunglasses handy. 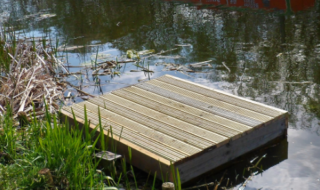 Good areas to try include the willows, the dam, plumbers, the seat, Marlow arm, deep water point and the stumps. Thank you to all that have submitted your catch returns this week. The information is valuable to us and to other fisherman so please continue to do this and a gentle reminder to those who may forget, thank you. This week we can also welcome another member to our Ranger team, Ross Lane. The Bob Church Open will be taking place on Sunday the 30th April so contact the Fishing Lodge to book a place. Good luck and tight lines for all at Grafham for the coming week. The Bob Church Open will be taking place on Sunday 30 April, please contact the Fishing Lodge to book a place. Best boat areas 6lb 13oz caught by Yvonne Webb. Best Brown 5lb 11oz taken by D Lyall. Best bank areas Stumps, the Willows, G Buoy, Deep Water Point, Hill Farm and Pylon Point. Mid week boat winner A Bayford of St Neots. Beginners courses 13, 23 & 30 April; 21 & 25 May and other dates throughout the season. Bob Church Open 30 April. Anglers have enjoyed another cracking week at Pitsford Water with a rod average of 6.2 for the week. This is thanks to the continuing huge buzzer hatches, we are seeing some of the large black buzzers coming off now and the fish are continuing to gorge on them. As with last week, bank sport can be tricky during the middle of the day as the fish move out of reach. This has benefitted boat anglers who have enjoyed the best of the action. Invicta FFC paid a visit last Tuesday for one of their boat league matches. 20 Anglers fished with 14 catching their limit. Most anglers caught on buzzer and diawl bachs. The best areas were Pig Stream, Gorse, Duffers and Stone Barn. By far the top boat on the day was Keith Gilchrist and Mack Facey. The pair reported catching over 60 fish. 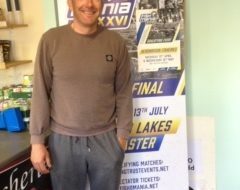 There have been plenty of fish in the 3-4lb bracket with anglers commenting on the quality of the stock fish. Best boat areas Causeway, Coton Car Park. Mid week boat winner Paul Southgate of Guilsborough. Beginners courses 21 April; 11,14 & 20 May and other dates throughout the season. Ravensthorpe continues to be in top form. Graham Smith and Mick Griffin had 52 fish to their boat – quill buzzers with a fab on the point proved very effective. Mick O’Farrell estimated he caught up to 80 fish again on floating line with buzzers. Andy Lane caught 24 fish with floating line with buzzers and diawl bachs, but also managed a few on dries. The bank is also producing some good fish with Platforms 11 and 12 to the Causeway being the best area. Alan Duffin had a good fish of 5lb 4oz on buzzers. Mid Northants Trout Fishers fished The Presidents Cup Floating Line Competition on Sunday. 29 anglers fished, netting 291 fish for a rod average of 10.